Furianne: Fall Fun Series: Fall Melting Stash Overview! Happy Labor Day! I'm cutting this post very, very close to the posting time I wanted to follow. How close? I have less than an hour until this post is supposed to go live. LOL! Please forgive me, I'm not usually this frazzled. I had much more excitement than I bargained for this weekend, which is 180% accountable for my lack of post preparedness. Today our Fall Fun Series (I was going to abbreviate this, but the abbreviation has already been taken by a much nastier phrase <_<) participants are sharing our fall melting stash! I have a recent post that includes my overall wax stash, but there have been some major renovations to my fall stash in the past month, making this a perfect time to post this! I have an Askvoll drawer from Ikea that holds my entire wax collection. The 2nd to bottom drawer holds my fall/winter scents, as well as dupes/musky scents. Here is my super duper organized wax sitting in the drawer. As you can see, I totally do not simply throw my wax in the drawer and hope it fits. LOL! If you have any questions on specific vendors and scents you see, don't be afraid to ask! First up we have our Candles From the Keeping Room. I feel like no fall stash is complete without a little of Carol's wax. Next, my CFTKR freebies! A few of these are very, very old. Their brown labeling gives them away. It is my goal to melt them before this season is over. Everyone, get your pom poms out and wave them around for me, please! You can do it, Liz! Next we have L3 Waxy Wonders. I haven't tried many of Jennifer's fall scents, but I've been impressed by the performance of her other wax so I'm not particularly worried. Finally, our miscellaneous pile! Some more L3, some Beezy Tarts, and some Lasting Scent Candles. Wow, that was short. I feel disappointed in my stash. Never fear! I have an order from The Bathing Garden coming in soon™ so my fall stash won't completely consist of 3 or 4 vendors. This doesn't include scents I have been gifted from friends. I keep gifts in a separate area and tend to melt whatever scents I want from that drawer when I need a pick-me-up. Unfortunately, there aren't any fall/Halloween sightings in stores for me to share. I haven't seen any decorations in stores. *cries* How am I supposed to stock up on decor?! 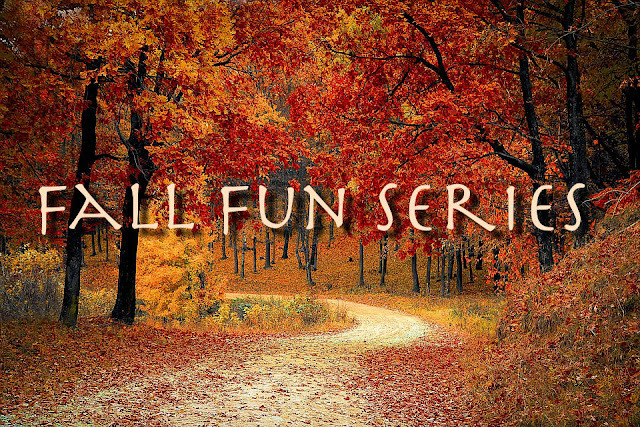 That's it for today's edition of the Fall Fun Series! Please feel free to join in at any time and let us know, and don't forget to visit these other ladies participating in the series! I am totally drooling over your CFTKR fall stash!! *cheers* You can DO it Liz!!! *rah rah siss boom bah* I love Carol's shapes. I have a corn on the cob and two pumpkins in Frost on the Pumpkin but I would be so sad to melt them that I just tuck them away in a dark corner and try to forget I have them. They will probably end up looking like your brown label tarts in a few years when Carol up grades her label or something. I am stoked about my TBG order coming too. So many great sounding scents. Have you seen her Scent of the Month?! Gah. I totally want to try it. Creamed corn and all. So sorry you have no fall store sightings in your area. :-( I am sending out a few fall/Halloween knick knacks but I know it is not the same as being able to pick your own. I love and hate Carol's shapes. They're gorgeous, so I love them. I hate them because I don't want to melt them.... because they're so gorgeous. LOL That's why this year I'm trying so hard to melt through my wax! I'm super hyped about my TBG order. Even though it's being sent to my parents' house first, making the wait even longer. I saw her scent of the month when I checked on my order the other day. Soooo delicious sounding! Nice fall stash! I haven't tried any of these brands before. CFTKR Juniper Berry & Cedar sounds right up my alley! Thanks! These are definitely some of my favorite brands. Consistent high performing wax. The only bummer is these vendors can be hard to order from or have a high TAT. Juniper Berry & Cedar is a fantastic scent! I highly recommend you try it if you get a chance! I think your stash is marvelous, not disappointing at all! And like Julie, I'm salivating over your ample CFTKR fall bounty! My pom poms are out and I'm cheering you on, a half a world away!! I have incredibly awesome luck with catching CFTKR openings. I think that's why I have so much of her wax. LOL! They're definitely awesome vendors to try out, but hard to get a hold of. Cute. :) The Candles From the Keeping Room stuff is so darn cute in their little rustic bags - love it. Thank you! I totally agree! Carol definitely knows how to make pretty wax and package them in a pleasing manner. Plus fantastic customer service? Yes, please! Your stash is amazing! I too have the same problem about melting Carol's shapes...they are so stinkin' cute that it's tough to justify ruining them! LOL! I haven't ordered from L3 in a loooooooooooooooooooooong time, is she still open? I was very proud to've melted ONE of Carol's tarts this past week... LOL. What are you talking about? Your fall stash is great! You have a great little stash of Candles from the Keeping Room! I have yet to make a purchase from her but I am really wanting to! I have my pom pom's ready to cheer for you girly!! I know this fall series will be a blast!